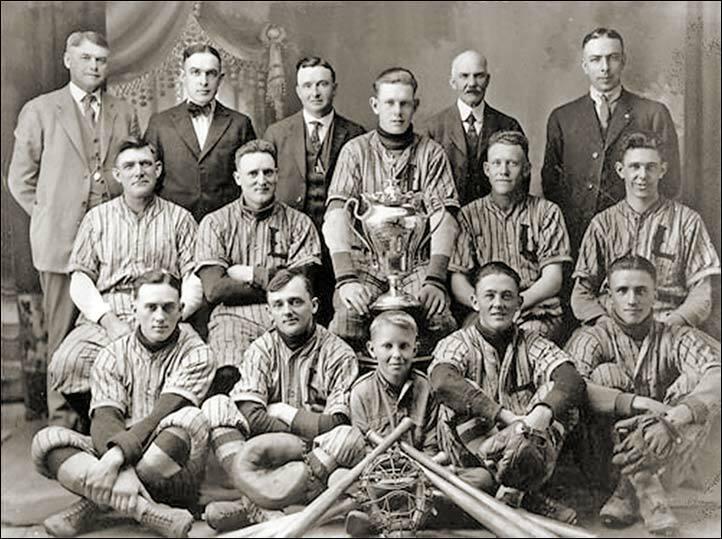 This is believed to be the 1921 Lacombe team (the Glenbow Museum has this photo identified as both the 1921 and 1923 teams). Back row (L-R) : A.M Campbell; Len Patterson; Bill Reid; Doctor Simpson; Archie Maconochie. Midele row (L-R) : Charlie Miller; Joe Edgerton; Fred Jackson; Pangman; Harold "Slim" Woodward. Front row (L-R) : Harry F. Teare, Bill Reid, bat boy (son of Bill Reid), Charlie Lewis; Bert Ritz. Absent is Mr. Bishop and Mr. Norrish.